If you’re on a diet, and looking for a protein-rich meal that’s rich with flavor but light on the calories and carbs, then you should definitely try our chicken wrap recipe. This dish is incredibly delicious: it features a sauce made from fresh mandarin oranges, soy sauce and ginger. Also, the recipe calls for whole-wheat tortillas, which means that this recipe is ideal for anyone who’s looking for a healthy, tasty but carb-light and portable dish for lunch or dinner. Do you happen to know someone who’s a fan of Asian-inspired cuisine? If so, then they might enjoy this dish—consider sharing the recipe with them on Facebook, Pinterest, Twitter and Instagram. Our chicken wrap recipe won’t take long to make. You’ll need one can of mandarin oranges, some low-sodium soy sauce, dried-ground ginger, hoisin sauce, shredded but cooked chicken, four whole-wheat tortillas, a grated carrot, zucchini, and four ounces of Cabot Sharp Lite75 Cheddar or Cabot Sharp Lite50 Cheddar. When preparing the sauce, pour two tablespoons of mandarin juice into a bowl. Add the soy sauce, ginger and hoisin sauce. Add chicken and toss until coated evenly. Spoon out your mandarins from the can and place on a paper towel—blot dry. Spread whatever hoisin sauce you have left onto a tortilla. Then serve the coated chicken on it. Add carrot, zucchini, oranges and some cheese. 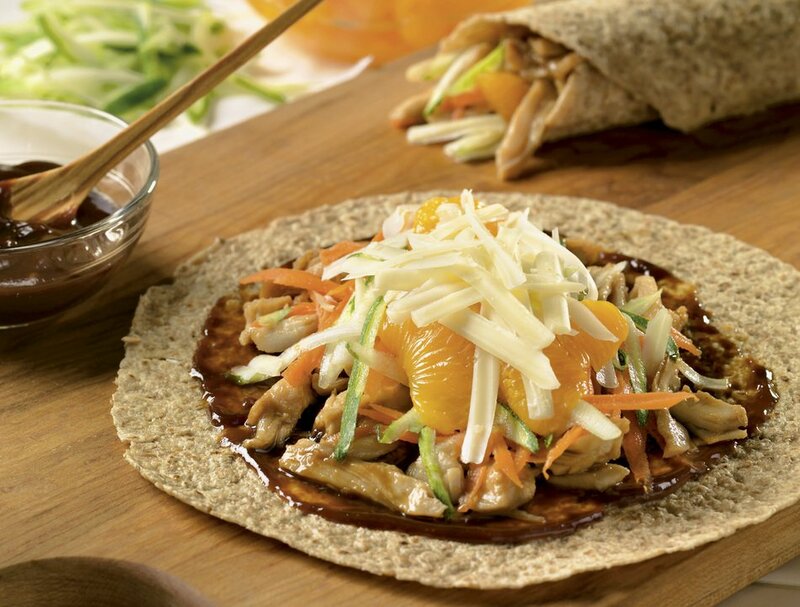 We hope you enjoyed our mandarin chicken wraps recipe. If you’re interested in trying another Cabot chicken dish, then try preparing our Cheddar-stuffed chicken. 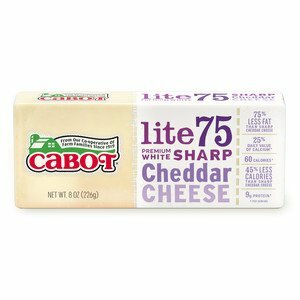 Cabot is a cooperative of over 800 farm families, and we’ve been making award-winning dairy products for generations. We’re confident that you’ll love our chicken wraps recipe, but we’d love to hear your thoughts about it. Is there anything we can do to improve it? Do you have any suggestions on ingredients we can add? Feel free to rate and review the dish—we can’t wait to check out your reviews! POUR 2 tablespoons of juice from mandarin oranges into medium bowl; add soy sauce, ginger and 2 tablespoons of hoisin sauce, stirring to combine. Add chicken and toss to coat. SPREAD remaining hoisin sauce evenly over one side of each tortilla. Divide chicken mixture evenly among tortillas. Top with carrot, zucchini, oranges and cheese; roll up. Slice in half diagonally and serve. Easy to make and super yummy too! 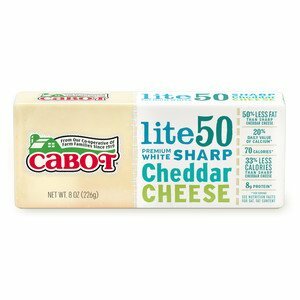 Love that I can use my favorite light cheeses thanks to Cabot!